ServerAtSchool enables you to work at home with your douments residing on the school server. 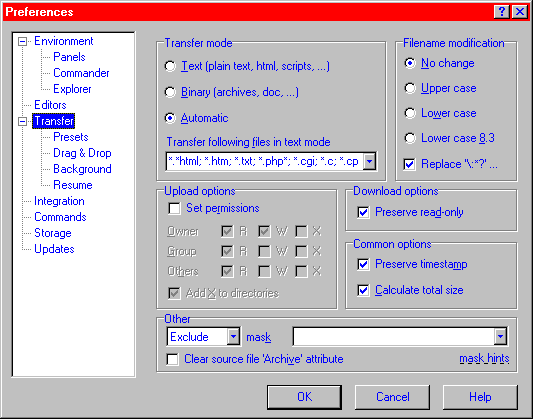 Using the open source WinSCP software, you can copy files and documents between your home computer (running Windows 95 or later) and the server at school. WinSCP uses an encrypted connection between the server at school and your home computer which provides a safe way of copying files via the inherently unsafe Internet. WinSCP can be downloaded free of charge from the project's home page at http://winscp.net. There are several versions available, including a multi-lingual one. Section 2. Setting up WinSCP on your computer at home discusses the installation and configuration of the English version of WinSCP on your home computer. Section 3. Getting started with WinSCP discusses the basic functions of WinSCP: connecting to the server at school, navigating through the directory trees, copying and editing files and disconnecting from the server at school. In section 4. 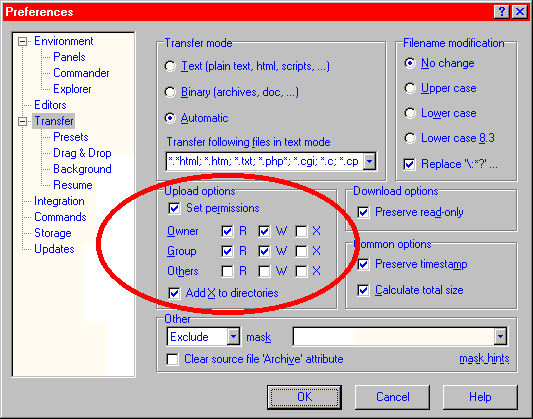 Advanced options a few special features of WinSCP are discussed. It is the responsibility of the school's local systems administrator to properly configure your account for teleworking. The local systems administrator should also have provided you with the necessary information about your account. However, it is your responsibility to keep your computer in good working condition. This means: keeping it free from viruses, spyware, worms and other malware. You will be connecting your computer to the server at school and you may copy files from your computer to school. If documents from your computer are infected with malware, you may - unknowingly - transfer malware to the school's server. Your local systems administrator will not be pleased when you do that. This chapter is illustrated using the home computer of Helen Parkhurst, the teacher of grade 3 of the Exemplum Primary School. See section 2. The Exemplum Primary School in chapter II. ServerAtSchool User Manual Overview for more information. Helen has received the following 'password letter' from Freddie Frinton, the local systems administrator. For clarity the lines of interest in this password letter are emphasised in the illustration below. Helen needs this information to set up and configure WinSCP on her home computer. Open 'My Computer' by double-clicking the appropriate icon on the Desktop. Open drive C: by double-clicking the appropriate icon. Open (or 'descend into') the directory called 'Program Files'. Further descend into the directory called 'WinSCP3'. The installation and configuration of WinSCP on your home computer consists of the following steps. There are various places to obtain the WinSCP software. First of all your local systems administrator may have placed the necessary file(s) on the school's webserver, making it easy for you to download the correct version. If this is not the case, you have to download the software via the project's home page at http://winscp.net. NOTICE: WinSCP is actively being developed. New versions of the software are released on a regular basis. At the time of writing the latest stable version of WinSCP was 3.7.6. This is the version that is used throughout the example installation in this chapter. Take the following steps to download the WinSCP software. Point your browser to the download area at http://winscp.net/eng/download.php. You see a list of files that could be downloaded. Download the 'Installation package' using the right hand mouse button. Save the file winscp376setup.exe on your computer, e.g. in C:\DOWNLOAD. Remember the name of the directory where you saved the downloaded file. After the download is completed, you can close the browser. NOTICE: If you wish to install WinSCP in another language than English, you should download winscp376setupintl.exe rather than winscp376setup.exe. If you want to install WinSCP on your home computer, you should take the following steps. If necessary, (re)boot your home computer. 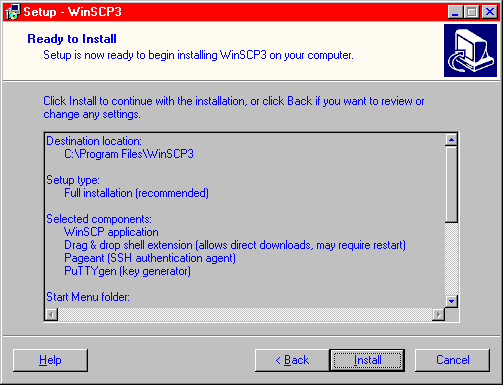 Start the WinSCP installation procedure. Navigate to: Start | Run. The 'Run' dialogue will be displayed. Press the [Browse] button. The 'Browse' dialogue will be displayed. Navigate to the directory where you have downloaded WinSCP, e.g. C:\DOWNLOAD. Select winscp376setup.exe and press the [Open] button. You return to the 'Run' dialogue which now displays the location of the program, e.g. C:\DOWNLOAD\winscp376setup.exe. 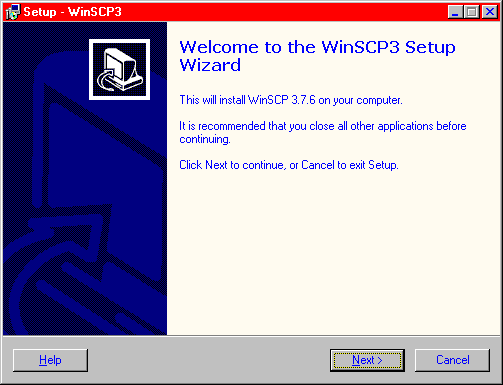 The 'WinSCP3 Setup Wizard' dialogue will be displayed, as illustrated below. Note that the illustrations in this chapter were created on the home computer of Helen Parkthurst. This explains the somewhat frivolous colour scheme. Press the [Next] button. 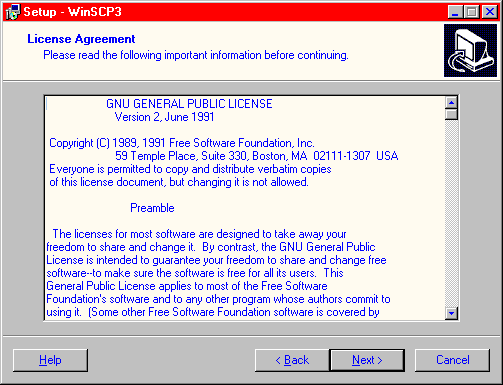 The License Agreement will be displayed, as illustrated below. Please take some time to read the License Agreement. Press the [Next] button. The 'Select Destination Location' dialogue will be displayed, as illustrated below. The dialogue shows the location where WinSCP will be installed. It is highly recommended to accept the default location C:\Program Files\WinSCP3. Press the [Next] button. The 'Select Components' dialogue will be displayed, as illustrated below. The dialogue shows which components will be installed. It is highly recommended to accept the default: install all components. NOTICE: If you would be installing the multi-lingual version, you would be able to select other languages in the 'Select Components' dialogue. These languages are not shown here. Press the [Next] button. 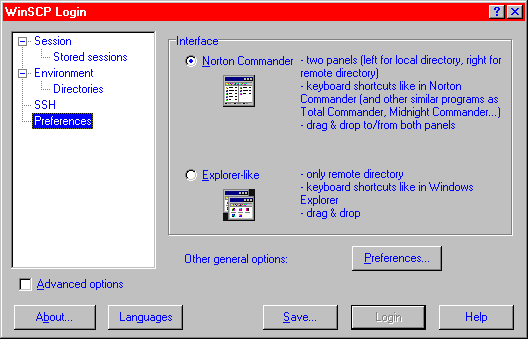 The 'Select Start Menu Folder' dialogue will be displayed, as illustrated below. If you do not want to have a Start Menu folder at all, check the box labeled 'Don't create a Start Menu folder'. Press the [Next] button. The 'Select Additional Tasks' dialogue will be displayed, as illustrated below. The illustration shows the recommended settings for the various additional tasks. However, if you want WinSCP to be available for all users on your home computer, select the option labeled '(Create a desktop icon) For all users' instead of the option '(Create a desktop icon) For the current user only'. NOTICE: It is recommended to not check the box labeled 'Create a Quick Launch icon'. We will be creating a customised Quick Launch icon later on, see section 4.2 Creating a Quick Launch icon for a stored session below. Press the [Next] button. The 'Initial user settings' dialogue will be displayed, as illustrated below. Check the box labeled 'Norton Commander Interface' if it is not already checked. Press the [Next] button. The setup wizard now shows the list of choices made in the previous dialogues, as illustrated below. Please verify that the correct installation options are shown. If you have made a mistake, press the [Back] button and correct the information. If you are satisfied with the selected options press the [Install] button to continue. The following dialogue will be displayed. The program is now being installed on your home computer, files are being copied, shortcuts are created, etc. This process does not take very long. After all files are copied and all other tasks are done, the following dialogue will be displayed. Please uncheck the box labeled 'Launch WinSCP' (as illustrated above). We will be starting the program via the shortcut on the Desktop later on and not directly, here and now, from the installation program. Press the [Finish] button. The final installation dialogue will disappear and you will be back at the Desktop. A shortcut was added to your Desktop by the installation wizard, as illustrated below. (optional) You can remove the file winscp376setup.exe from your computer if you wish. This file is no longer needed because the WinSCP software is now installed. Before logging on to the server at school for the first time, a few essential settings should configured. This is discussed in section 2.3.1 File permissions for upload below. After configuring the file permissions, the information for the connection to the school server should be stored in a so-called 'session'. This is discussed in section 2.3.2 Hostname, username and protocol below. Finally, all settings should be saved. This is discussed in section 2.3.3 Saving the configuration below. For security reasons files and documents are stored on the server at school with carefully chosen file permissions. When you upload files and documents from your home computer to the server at school, the permissions of files you upload should fit into this scheme of permissions. If permissions are not set correctly, your colleagues may encounter problems when accessing shared documents that you upload or, even worse, your confidential documents may become readable by anyone (including pupils). Configuring the file permissions is a one-time operation that should be carried out with great precision. Please take the following steps to configure the file permissions for upload. Start WinSCP for the first time, e.g. by double-clicking the WinSCP shortcut on the Desktop. Alternatively you can navigate to: Start | Programs | WinSCP3 | WinSCP3 to start the program. The following dialogue will be displayed. A tree-structure will be displayed on the left hand side of the dialogue window. Navigate to 'Preferences' settings by clicking on the word 'Preferences' with the left hand mouse button. The following dialogue will be displayed. Press the button [Preferences]. The following dialogue will be displayed. Note that the tree-structure on the left hand side has changed. By default you start in the 'Environment' settings branch. Navigate to: 'Transfer' settings by clicking on the word 'Transfer' in the tree-structure. The following dialogue will be displayed. Note that in this dialogue the 'Upload options' are inactive. Configure the upload options as follows. Check the box labeled 'Set permissions'. The other fields in the 'Upload options' pane become active. In the row 'Group' check the box labeled 'W'. In the row 'Others' uncheck the box labeled 'R'. Do not change other settings in this dialogue. At this point the settings in this dialogue should look as illustrated below. The 'Upload options' pane is emphasised with a red marking. Press the [OK] button. You return to the dialogue in step 2. Navigate to: 'Session' settings by clicking on the word 'Session' in the tree-structure at the left hand side of the dialogue. You return to the dialogue in step 1. At this point the important file permissions are properly configured. In order to connect to the server at school you need to log on to the server. You can do this by entering the account details manually each time you want to log on. However, this is error-prone. It is very convenient to store the pertinent information in a so-called 'session'. This session can then be selected and used every time you want to log on to the server at school with WinSCP. Using a session makes it easy to connect to the server at school and, as an added benefit, typing errors are prevented. If you want to configure a session, you need the following information. The hostname of the server at school. This information should be provided by your local systems administrator. See section 1.2 The Exemplum Primary School above for details. Please take the following steps to set up a session. Make sure that the 'WinSCP Login' dialogue is displayed. Enter the following information into the dialogue. Hostname: Enter the name of the server at school (here: praeceptor.exemplum.serveratschool.net). Username: Enter your username (here: hparkh). The dialogue now looks like this. (strictly optional) WinSCP can also store your password for you. This may sound very convenient (you never have to type your password again) but it is also a security risk. It may even be against the school's policies for working at home to store your password this way. Please refer to section 2.3.4 Reasons for not saving the password below before you really enter your valuable secret password in the dialogue. If you really want to save your password as part of the session, you can add the following information too. Password: Enter your password (here: wWITa4ye). After entering your password the dialogue looks like this. (optional) Check the protocol settings. Depending on the exact configuration of the server at school you may need to select the option 'SCP' instead of 'SFTP (allow SCP fallback)'. By default, however, any of the three possible settings should work. At this point the pertinent information for your connection to the server at school is entered, but not yet saved permanently. The next section discusses the procedure for saving the settings. Please take the following steps to save the settings. In the 'WinSCP Login' dialogue, where you entered your session information, press the [Save] button. 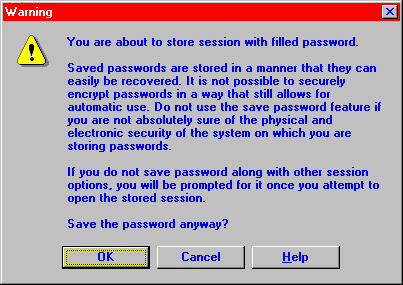 (optional) If you decided to store your valuable password in the session, the following warning message will be displayed. Please take some time to re-think your decision. Do you really want to store your password on your home computer? See also section 2.3.4 Reasons for not saving the password below. Press the [Cancel] button if you changed your mind. You will return to the previous dialogue. Alternatively you can press [OK] to continue with the next step. At this point the following dialogue will be displayed. Here you can enter a name under which you wish to store the session. By default a name is constructed based on user username and the hostname (here: hparkh@praeceptor.exemplum.serveratschool.net). Change the proposed session name to a something that looks a little more comprehensible than this default session name, e.g. 'Helen at School'. The dialogue now looks like this. Press the [OK] button. All settings will be saved and the following dialogue appears. Close WinSCP by hitting [Alt-F4] or by clicking on the 'X' in the top right corner of the main WinSCP window. Note that there now is a list of 'stored sessions' with a single entry called 'Helen at School'. Instead of logging on manually, specifying hostname, username and password every time, you can select a stored session from the list and simply press the [Login] button. That is a real timesaver. NOTICE: If you happen to work on a school with two different locations, say the R.L Stevensonschool, each with their own server at school, you could have a stored session for each location. One session could be called 'Helen at School - Uptown' and the other 'Helen at School - Downtown'. That is much more understandable than having two stored sessions called hparkh@jekyll.uptown.stevensonschool.net and hparkh@hide.downtown.stevensonschool.net. Because there is now at least one stored session in the list, from now on WinSCP will display this list of stored sessions upon program start rather than the 'empty' session that was displayed the very first time WinSCP was started. There are very good reasons for not saving your password in the stored session. The most important reason is that anyone who has access to your computer at home (your spouse or your childeren) will have access to your documents at school, too. Even if all members of your household can be completely trusted, there is a risk that somehow your computer is compromised (due to a virus or other malware) or stolen and your password falls into the wrong hands. If this happens, your school account may be compromised, too. If you do not store your password on the computer, you have to retype the password every time you connect to the server at school. This is a trade off between convenience and security. However, because you will be using this password for access to e-mail too, you will probably memorise this password in no-time. Then the choice between convenience and security becomes an easy one, in favour of security. An in-depth discussion of security measures and WinSCP is beyond the scope of this manual. More information can be found in the on-line WinSCP documentation at http://winscp.net/eng/docs/security. This section documents the basic WinSCP operations such as connecting to the server at school, navigating through the directory structure on the server, copying files from your home computer to the server and vice versa, editing files and finally disconnecting from the server at school. The WinSCP program is installed and configured. Now you can connect your computer to the server at school. Take the following steps to connect your home computer to the server at school. (optional) Make sure that your Internet-connection is 'up'. A working Internet-connection is required when working with WinSCP. Start WinSCP, e.g. by double-clicking the WinSCP shortcut on the Desktop. 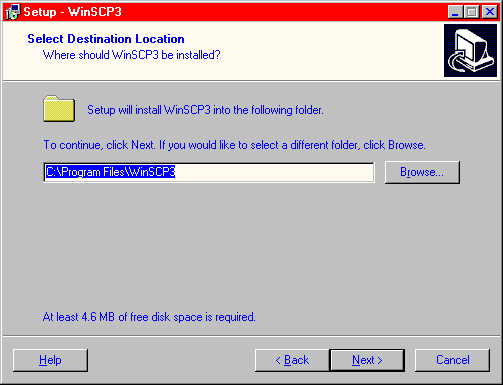 Alternatively you can navigate to: Start | Programs | WinSCP3 | WinSCP3 to start the program. The following dialogue will now be displayed. If you have more than one stored session in the list, you need to select the appropriate stored session by moving the selection bar (indicated with a blue background colour in the illustration) with [Cursor Up] or [Cursor Down]. Note that in this example there is only a single stored session: 'Helen at School'. This session is selected by default. Press the [Login] button to start the selected stored session (here: 'Helen at School'). The first time you try to establish the connection to the server at school, a warning dialogue will be displayed, as illustrated below. 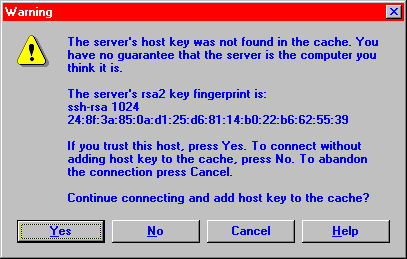 This warning shows the so-called 'fingerprint' of the cryptographic key that is associated with the remote server. If the fingerprint (here: 24:8f:3a:85:0a:d1:25:d6:81:14:b0:22:b6:62:55:39) matches the fingerprint that was provided to you by your local systems administrator (see the 'password letter' in section 1.2 The Exemplum Primary School above) you can be quite confident that you are in fact connecting to the server at school and not some stray server. If the fingerprints do match, you can safely press the [Yes] button. This will save the fingerprint on your home computer, for future reference. That is: the next time you establish the connection with the server at school, you will not be prompted again to verify the fingerprint. If the fingerprints do not match, you should press the [Cancel] button in order to terminate the connection immediately. After that, you should inform your local systems administrator that there was a problem with the fingerprints. After you press the [Yes] button, the 'Enter password' dialogue will be displayed. You need to enter your password into the dialogue (here: 'wWITa4ye', see section 1.2 The Exemplum Primary School above). The actual password will not be shown but asterisks will be displayed instead, as illustrated below. This is a security measure. After you have entered your password in the previous step, press the [OK] button to confirm the 'Enter password' dialogue. The WinSCP main screen will be displayed, as illustrated below. You are now successfully connected with the server at your school. After the connection to the server at school is established successfully, the WinSCP main screen will be displayed. The left hand side of the main screen represents the local computer, i.e your computer at home. In the illustration above the current directory is C:\My Documents. The contents of that directory will be displayed. The right hand side of the main screen represents the remote computer, i.e. the server at school. In the illustration above the current directory is /home/users/hparkh. The contents of this directory will be displayed. NOTICE: Section 4.1 Setting the starting directory discusses the method to change the default starting directory. Note that the directory on the server at school shows a subdirectory H. This directory is the exact equivalent of the H: drive you use when you log on to the school network when you are at school. There are several important functions to navigate through the directory structures and manipulate files. The most important ones are listed below. Double-clicking a directory opens the directory. Double-clicking the directory labeled with two dots brings you to the directory one level higher. Clicking a filename once selects that single file. By pressing and holding [Ctrl] and clicking the left hand mouse button you can select multiple files. Hitting [F5] copies the selected file or files to the 'other' side, i.e. either from school to your computer or from your computer to school. Hitting [F6] moves the selected file or files to the 'other' side, i.e. either from school to your computer or from your computer to school. No copy of the file is retained on 'this' side. Double-clicking a local file starts the corresponding application on your computer. uploads the file from local to remote again after the application finishes. See also section 3.4 Editing below. You copy a file from school to home or vice versa by selecting the file and hitting [F5]. This process is illustrated below using the document 'Strategy 2005-2006' of the Healthcare Committee of which Helen Parkhurst is a member. If you want to copy the document 'Strategy 2005-2006' from the server at school to your computer at home, you should take the following steps. Navigate to the local directory to which the document is to be stored, in the left hand pane. In this example that would be C:\My Documens\Exemplum\healthcare. Navigate to the remote directory where the document resides, in the right hand pane. In this example that would be /home/users/hparkh/H/My Documens/healthcare. Select the document 'Strategy 2005-2006' by clicking on the name once with the left hand mouse button. Hit [F5]. The following dialogue appears. Press the [Copy] button to confirm the dialogue. If there already exists a file by the same name in the target directory, a dialogue like the following will be displayed. This messages warns you about an already existing version of the file, including the modification date and time and the size. You have to select one of the following options by pressing the corresponding button. Yes: You copy the file and overwrite the existing file. No: You do not copy the file and you keep the file that already exists. Abort: Cancel the operation alltogether. Newer only: You only copy a file when it is of a more recent date than the file that already exists. No to All: Do not copy any files that already exist. Yes to All: Copy all files and overwrite any files that already exist. If you agreed to overwrite the existing file or when there was no existing file yet, the actual copying starts. During that process, the following dialogue shows the progress of the copying operation. For large files this may take some time. To work on a document at school, simply double-click on the filename. The corresponding application at home will start and you can work in the program and modify the file. When the file is saved, it is saved at school. Note that behind the scenes WinSCP still downloads the file from the server to your local computer. This is very noticable when editing large files. Also, the modified copy of the file is uploaded automatically by WinSCP, again behind the scenes. This, too, may take some time. If you edit a file again and again in the same session, you end up downloading and uploading the file several times. This can take a lot of time. Even though it is possible to modify a file or document on the server by simply double-clicking it, it is safer to first download the file from remote to local, modify the file locally and afterwards upload the modified file again. The recommended procedure is as follows. Copy the file from the server at school to your computer at home, using the procedure outlined in section 3.3 Copying above. Navigate to the local directory in which the document is copied in the previous step. Double-click the file to open the file the corresponding application on your computer. (optional) You might want to disconnect from the server at school now (see section 3.5 Disconnecting from the server at school below) and also bring your Internet-connection 'down', especially when your Internet-connection is charged by the minute. Modify the file and eventually save your changes, in your local copy of the file. (optional) Bring your Internet-connection 'up' again, and log on to the server at school again with WinSCP. Copy the file from your computer at home back to the server at school, using the procedure outlined in section 3.3 Copying above, but this time in the opposite direction. When you are done with copying files from the server at school to your computer at home or vice versa, you can disconnect from the server at school by taking the following steps. Make sure that you are looking at the main screen of WinSCP. Navigate to: Session | Disconnect. The WinSCP session with the server at school will be closed. Alternatively you may hit [Shift-Ctrl-D] on the keyboard. Either way you will return to the list of stored sessions, as illustrated below. Hit the [Esc] key. The WinSCP program terminates and you will return to your Desktop. NOTICE: You can also hit [F10] while in the WinSCP main screen. This will close the session and terminate WinSCP in one go. When you start WinSCP two directories will be displayed: one on your home computer (on the left hand side) and one on the server at school (on the right hand side). These defaults may or may not suit your preferences. You can change the default directories using the procedure outlined below. In this example Hele Parkhurst wishes to change the default local starting directory to be C:\My Documents\Exemplum because that is the place she wants to keep all files and documents related to school, on her computer at home. She also wants to change the default remote starting directory to be /home/users/hparkh/H/My Documents because that is the exact equivalent of H:\My Documents and therefore of the shortcut 'My Documents' when she is logged on to the network at school. You can change the default starting directories by taking the following steps. Connect to the server at school using the procedure outlined in section 3.1 Connecting to the server at school above. You will see the WinSCP main screen. In the left hand pane, navigate to C:\My Documents\Exemplum using the procedure outlined in section 3.2 Navigating above. In the right hand pane, navigate to /home/users/hparkh/H/My Documents using the procedure outlined in section 3.2 Navigating above. The WinSCP main screen will now look like this. Navigate to: Session | Save Session. The following dialogue appears. Press the [OK] button. The following dialogue appears. Press the [Yes] button. The changed settings are now saved in the stored session 'Helen at School'. The next time WinSCP is started, these two directories C:\My Documents\Exemplum and /home/users/hparkh/H/My Documents will be displayed in the WinSCP main screen by default. A very convenient way to start WinSCP is to add a shortcut to the Quick Launch bar, next to the [Start] button. If you do so, it will only take a single mouse click to start the WinSCP program rather than two (compared to double-clicking the WinSCP shortcut on the Desktop) or more (when navigating to: Start | Programs | WinSCP | WinSCP). Adding a shortcut to the Quick Launch bar was an option in the 'Additional Tasks' dialogue in the WinSCP Setup Wizard (see section 2.2 Installing WinSCP above). However, that shortcut would have lead to the normal WinSCP openingsscreen: the list of stored sessions. In the procedure below we will be creating a Quick Launch shortcut for the stored session 'Helen at School'. Upon start this shortcut will immediately set up the connection to the server at school, with just a single mouse click. Take the following steps to create a Quick Launch shortcut for the stored session 'Helen at School'. If necessary close the WinSCP program. Start WinSCP, e.g. by double-clicking the WinSCP shortcut on the Desktop. Alternatively you can navigate to: Start | Programs | WinSCP3 | WinSCP3 to start the program. The following dialogue will be displayed. Press the [Shell icon] button. A pop-up menu appears. From the pop-up menu, select the option 'Desktop icon'. The following dialogue appears. Press the [Yes] button. A shortcut is added to the Desktop. You return to the list of stored sessions in WinSCP. Close WinSCP, e.g. by hitting [Esc] or [Alt-F4]. The Desktop will reappear, with a shortcut labeled 'Helen at School' added, as illustrated below. Move the mouse pointer to the new shortcut icon on the Desktop. Press, and hold, the left hand mouse button, move the mouse to an empty part of the Quick Launch bar and release the mouse button. You have now moved the session icon from the Desktop to the Quick Launch bar using 'drag-and-drop'. The result is shown in the illustration below. You can now connect to the server at school with the stored session 'Helen at School' by clicking the new icon in the Quick Launch bar just once. WinSCP has many, many options. Please take a look at the WinSCP website at http://winscp.net and more specific the on-line documentation at http://winscp.net/eng/docs/start. A FAQ (Frequently Asked Questions) can be found at http://winscp.net/eng/docs/faq. This chapter has introduced you to the WinSCP program. This program allows you to work with files and documents on the server at your school. Because WinSCP is based on copying files back and forth, copies of school documents and files end up on the hard disk of your computer. Depending on the options you have configured and the features you have enabled, a copy of the complete contents of your 'My Documents' at school may be stored on your home computer. In the case of Helen Parkhurst, this might include confidential documents from shared directories, e.g. dossiers from the Healthcare Committee. All the pupils' documents may end up on her computer, too. WinSCP gives you a lot of power, it is up to you to use this power in a responsible way.